God protect and preserve our nation. Great Dankuk people, stay true to the Great Dankuk way! Que Dios nos guarde, que viva Drania. Resistiendo tormentas y heladas, que así sea nuestro espíritu. La luna radiando en nuestros corazónes, único y confiable. con nuestro espíritu y nuestro corazón. Dranianos, que se mantenga vivo nuestro camino. May Duw ein cadw ni, gall Corea fyw. Yn gwrthsefyll stormydd a gwlyb, felly byddwch yn ysbryd. Mae'r lleuad yn ysgogi yn ein calonnau, yn unigryw ac yn ddibynadwy. Dankukid, gadewch inni gadw ein llwybr yn fyw. Note:This nation has 3 other official anthems, one for the Kyo Empress, one for the Draddwyr King, and one dynastic one for the Taeyang family. The subnational divisions, also referred to as regions[? 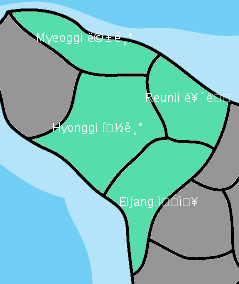 ], of the Union of Dankuk(단연방국)(Unión de Dankuk) (Undeb Dankuk) are each referred to as a Provincia (도 Do).